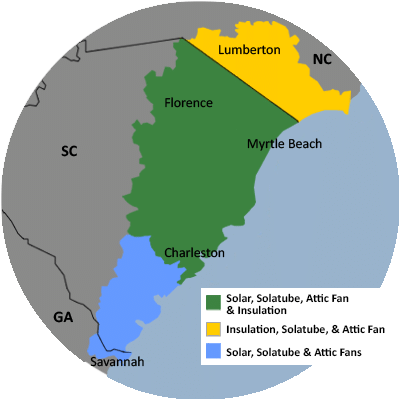 "Nico and Tim was truly a pleasure to work with they done a..."
For a FREE no-obligation estimate in Florence County, SC, please fill out the form to the right and Carolina Energy Conservation will contact you shortly. We specialize in a variety of services aimed to lessen your home's carbon footprint and save energy and money each month! We offer it all, from air sealing to ductwork to insulation and HVAC services in Florence County, SC. For a FREE, no-obligation services estimate in Florence County, SC, you'll also receive a free copy of "Saving Energy and Money at Home," a great book to use as you begin to create a more comfortable, healthy, and energy efficient home! Fernando has a larger home that tends to use a lot of energy, which was costing him a lot of money each month. He learned that not only could solar energy help offset his dependence on the utility company, but by having it installed he is reducing his carbon footprint! So, Fernando did some research for the best panels on the market. During his search, he found Carolina Energy Conservation. After compairing prices and products, Fernando decided to have Carolina Energy Conservation install his 47 panel solar system! Now, Fernando has offset his utility usage by 58% and is looking at ~$100,000 in savings over the next 25 years!